NEWPORT, Ky. – The time is now to say goodbye to Bravo, the largest turtle in the Midwest, after Newport Aquarium announced Tuesday the Turtle Canyon exhibit will close March 1. Bravo, a 650-pound Galapagos tortoise, is scheduled to return to his home at Riverbanks Zoo and Garden in Columbia, S.C. on March 2. 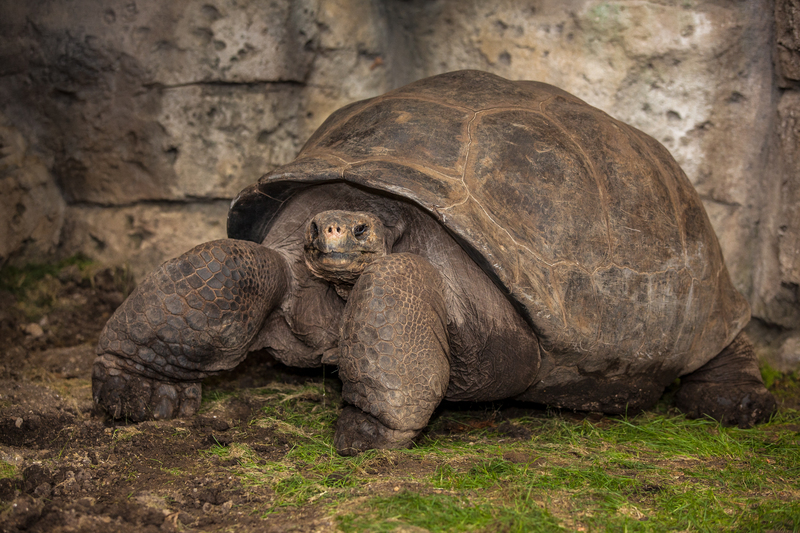 Bravo, a 650-pound Galapagos tortoise, is the largest turtle in the Midwest. Upon Bravo’s departure from Newport Aquarium, the Turtle Canyon exhibit will temporarily close for renovations. The greenhouse-like facility will re-open as a new exhibit in mid-March. Details will be revealed at a Jan. 14 news conference. This family-favorite offer will be available from Jan. 7 through March 1, during which time the aquarium will open one hour early at 9 a.m. every Saturday and holiday weekend. Your kids will have fun inside our 72-degree climate-controlled facility, no matter the weather outside. Turtle Canyon – Features a diverse collection of more than 14 species of turtles that span three continents, including Bravo and Thunder, an over 100-year-old snapping turtle. Surrounded by Sharks – Guests can walk through a 385,000-gallon tank filled with four rare and exotic shark rays, six species of shark, and Denver, the mischievous 200-pound loggerhead sea turtle. Gator Alley – Showcasing six species of crocodilians from four continents, Gator Alley has one of the most diverse collections of crocodilian species in the country. It’s the home of Mighty Mike – who at 14-feet long and 800 pounds is the biggest and baddest alligator in the country outside of Florida, as well as Snowball and Snowflake, two of less than 100 white alligators in the world. Kroger Penguin Palooza – With five different sub-Antarctic penguin species totaling 49 birds, Kroger Penguin Palooza boasts one of the most diverse collections of cold-weather penguins in the country. Frog Bog – Children have never seen frogs like this before as they can find secret frog tanks visible only when they climb through tunnels and tubes in the kids-only Frog Bog jungle gym. Frog Bog is the largest exhibit of its kind in the Midwest with nearly 20 species of exotic frogs. Jellyfish Gallery – With more than one hundred jellyfish on display, guests will marvel at the largest and coolest jellyfish exhibit in the Midwest. Beginning Jan. 6, Winter Family Days tickets will be available at the Newport Aquarium ticket window, online at NewportAquarium.com or by phone at 800-406-FISH (3474). *This special offer cannot be combined with other discounts or coupons. Newport Aquarium, voted the No. 1 aquarium in the country according to USA Today’s 10Best.com in 2012, has showcased thousands of animals from around the world in a million gallons of water since 1999. Named a top U.S. aquarium by US City Traveler in 2014 and by Travel Channel in 2013, Newport Aquarium is a Herschend Family Entertainment company and an accredited member of the Association of Zoos and Aquariums. Newport Aquarium is open to the public 365 days a year and is located across the Ohio River from downtown Cincinnati at Newport on the Levee. This entry was posted in Goodbye Bravo and tagged Galapagos tortoise, Goodbye Bravo, newport aquarium, turtle, Winter Family Days by NewportAquarium. Bookmark the permalink.